Situated on a long peninsula that stabs like a knife into the heart of the Sea of Fallen Stars, Aglarond is a land of open water and deep woods. Here humans and elves have intermingled for centuries, and nowhere else in Faerûn is there a greater concentration of half-elves. The land has long stood as a bulwark holding back the Red Wizards of Thay from the western lands. This is a thankless task, but the people of Aglarond take it up not for the survival of other countries, but their own. The Aglarondan peninsula is roughly 540 miles long from the westernmost islands off the peninsula's tip to the eastern edge of the Umber Marshes. At its widest point, it's around 180 miles across, but this narrows to practically nothing at its western tip. The vast portion of this length of land is roughly 150 miles across from north to south. Much of the Dragonjaw Mountains are also part of Aglarond, although the northwestern range is generally considered part of Thesk. However, the lands beyond the fortress at Emmech are past the direct protection of the armies of Aglarond and are thinly populated for this reason among others. This is an unforgiving part of the country, beset not only by monsters but by the ever-encroaching forces of Thay. Today, the minions of the Red Wizards are more rare, but the area's monsters still pose a grave threat to homesteaders and travelers alike. Although Aglarond is at roughly the same latitude as Cormyr its weather is much more moderate. No place in the country - even the heart of the Yuirwood - is farther than ninety miles from the sea, arid most of its cities are actually on the peninsula's rocky coast. The waters moderate the weather, so the seasons are rarely as harsh as they are elsewhere. Aglarond is isolated from the rest of Faerûn by the plateau of Thay to the east and the Sea of Fallen Stars on three other sides. Thus it separates the Easting Reach of the north from the Wizards' Reach and the Alamber Sea of the south. The Pirate Isles lie only a hundred miles or so off Aglarond's own western islands, but since piracy is punishable by immediate execution in Aglarond, most buccaneers give the land a wide berth. The length of water that separates Aglarond from Thesk is known as the Sea of Dlurg. This is more of a bay than a proper sea: At its narrowest point, about midway clown its length, only fifteen miles separate the city of Furthinghome from the Theskian shore. While the Yuirwood covers much of Aglarond, the land between the trees and the shore consists of fertile, rolling hills that make excellent farmland. Farms are rarely more than ten miles from the shore. The half-elves who make their home under the Yuirwood's leafy canopy discourage large-scale settlement of the forest with a mixture of compromise, diplomacy, and the occasional veiled threat. Despite such efforts, though, the woods continue to recede every year. Grasses, shrubs, and vines quickly reclaim abandoned farmsteads, but trees are slow to return to territory stripped from the Yuirwood long ago. From its rocky shores to the heart of the Yuirwood, Aglarond is a land that defines its people as much as they define it. Its isolation and its long history of sieges by Thay have made the once-trusting Aglarondan people suspicious of outlanders - anyone could be an agent of their hated enemy. As the edges of the Yuirwood recede, Aglarondans have become exposed to the scrutiny of the outer world, forcing them to interact more with those from without. 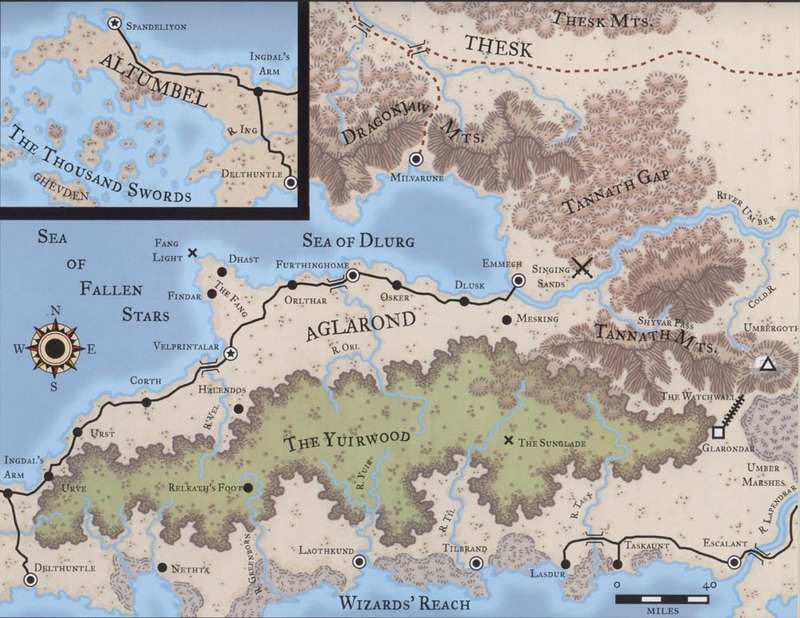 To most people, all of the Aglarondan peninsula is one land, but not to those who live in Altumbel. When Aglarond was formed many centuries ago, after long years of war, humans and half-elves agreed to share power in the form of a council of locally appointed leaders led by a king. A number of humans were too bitter from the wars to lay aside their animosity. Rather than become part of this new nation, they set out for the far western end of the peninsula, claiming it as their own. In addition to the narrow cape at the end of the Aglarondan peninsula, Altumbel includes the mazelike archipelago of the Thousand Swords. Most of these islets are desolate and rocky, covered with low scrub and lichen, but some are fairly large. Ghevden, the largest, is more than thirty miles wide and is home to several populous villages of fishers, herders, and merchants. One-third of Altumbel's people live scattered over the barren Swords. Pirates harry the islands, but many hail from the Swords themselves - raiding one's neighbors is something of a local tradition. Altumbel and its archipelago are almost entirely devoid of woods. The people here don't care for trees, which remind them of the Yuirwood's half-elves. Most make their living from the sea, either netting fish or trapping shellfish. The land is rocky and unforgiving, not much good for farming, although some sheltered dells are suitable for gardening. These sun-warmed and wind-protected valleys usually have springs and the occasional cave. Altumbel boasts a history of harboring pirates, daring (or foolhardy) characters who knew the lay of the reefs beneath the sea and used them to confound less knowledgeable pursuers. In fact, Spandeliyon, the capital of the region, is still known as the City of Pirates. These days, however, the Simbul's harsh punishment of pirates has put the lie to that name. Few dare to brave the lady's wrath, even in a city so far from her home in Velprintalar. Beyond the rocky, fag-cloaked northern shores of Altumbel - and all Aglarond, in fact - the sea quickly drops off into a deep trench. The seasonal upwelling of cold, nutrient-rich waters make this place a fisher's paradise. The Dragonjaws separate Aglarond from Thesk to the north. While relations between the two countries are generally fine, both are happy to have a bit of distance between them. For Aglarond, the Dragonjaw Mountains are another natural defense against the forces of Thay or other invaders, preventing armies from crossing the River Umber or the Sea of Dlurg. The northern coastal settlements face only a few small fishing villages across the watery gap, hugging the sheer faces of slopes that drop rapidly into the sea. Only the Tannath Mountains and the Tannath Gap - both described later - are considered part of Aglarond. The rest of the mountains belong solidly to Thesk. This massive, magically engineered length of stone wall stretches from the fortress city of Glarondar to the slopes of Umbergoth. This extends the defensive barrier of the Dragonjaw Mountains another fifteen miles, up to a rocklike fortification containing one-third of Aglarond's armed forces. The galeb duhrs - a race of earth elementals - built the wall during the reign of King Brindor, the first ruler of Aglarond. In exchange, the king pledged the aid of his people whenever the galeb duhrs might call for it. So far they have not, but if the Thayans ever turn their attention to this secretive people, the Simbul would be obliged to come to their rescue, no matter the potential cost. The Watchwall is 30 feet high and 10 feet thick. It is seamless (Climb DC 25) and features no gates or windows. Wide stairs are carved into the Aglarond side of the wall every quarter-mile or so, and the guards atop the wall - known as the Watchers - carry rope to lower themselves down in case of emergency. They sometimes throw a rope down to visitors on the Thayan side, but only to those confirmed as friends of Aglarond. Units of the Aglarondan army stationed at Glarondar patrol the length of the Watchwall at all times, staring out across the desolate Umber Marshes. Recently they've observed a number of shambling mounds staring back, but the creatures have taken no further step toward the wall, watching quietly even as the occasional lost unit of undead Thayan soldiers makes a mad attack. Thayan diplomats explain away these incidents as regrettable but understandable; the Red Wizards created thousands of such creatures, many of which went missing after the latest round of hostilities. Guard barracks are set up on the Aglarondan side of the wall, one at each mile marker. When not on patrol, the Watchwall's soldiers rest here, preparing for the call to arms they know must inevitably come. Whether it happens sooner or later is anyone's guess. The Fang is the part of the north coast that juts out the farthest into the sea. Although close to Aglarond's capital, its people here consider themselves part of another land. This hard territory contains two settlements: Findar and Dhast. Both are windswept fishing ports filled with people who are as weathered as their homes. The people of the Fang (derisively called Fangers) are even more suspicious of foreigners than those of Altumbel. They don't dislike just half-elves; they can't stand anyone who wasn't born and raised in the area. There are no inns in this land. Strangers simply are not welcome. A gleaming white tower known as the Fang Light stands proudly at the far end of the Fang. The wizard Thymar (NG male human Wiz12) tends to the beacon atop the tower, a light that guides travelers clear of the local reefs. Unbeknownst to the rest of the world, an Altumbellan pirate, Quelzur Naismen (LE male human Rog5/Sor8), has recently captured the lighthouse - and Thymar along with it. Naismen is in the pay of the Sons of Hoar, who want to disrupt trade in the area; the sinister marauder uses a hut of disguise to pose as Thymar, manipulating the beacon to cause ship after ship to founder on the nearby reefs. He has so far sent half a dozen vessels to a watery end and plundered their holds. Someone's sure to come looking for the ships eventually, but when that happens, Naismen will be ready. The Tannath Mountains form the southern range of the Dragonjaws, south of the River Umber, which flows from the heart of Thay past the Aglarondan fortress at Emmech. Tall and rugged, they form the bulk of Aglarond's geographical defenses against Thay. They are considered unscalable by humanoids - especially the peak of Umbergoth at the easternmost edge - but wide passes flank them on both sides. To the west is the Tannath Gap, while the Shyvar Pass is wedged between the rest of the Tannaths and Umbergoth to the east. The steep, bare slopes of the Tannaths are a discouraging prospect for most homesteaders. Little more than birds and mountain goats reside here. The most notable exceptions are the griffons that nest atop the highest peaks and, the ancient fang dragon of Umbergoth. The Tannath Gap is a narrow range of woodland between the Tannaths and the rest of the Dragonjaw Mountains. The slopes drop steeply to the narrow plains surrounding the River Umber, which winds down the middle of the gap. The fauna is typical for the region: deer, foxes, squirrels, badgers, raccoons, opossums, otters, beavers, and so on; there are few monsters here. Travelers, Thayan invaders, and Aglarondan defenders alike have hunted most dangerous species in the region to near extinction - only the occasional mountain lion is a threat. Those creatures smart enough to realize they were not welcome have long since left. Still, unnatural creatures wander through the Gap. Attentive travelers can spot griffons from the Tannaths soaring overhead, but they rarely get close enough to interact with earthbound souls. The River Umber, long a natural barrier between Aglarond and its neighbors, has recently become a pulsing artery of trade passing in and out of the country through Emmech. Despite the recent improvement in relations between Aglarond and Thay, though, few dare to eat fish from the waters of the Umber, much less swim in it. Living downriver from a civilization that has spent centuries trying to destroy them has created generations of distrust that a few good years of trade won't allay. The Shyvar Pass is a much more difficult passage through the Tannath Mountains than the Tannath Gap, varying in width from 100 yards to ten miles. It seems a natural invasion route for Thay, and the Red Wizards have attempted the pass several times over the centuries. However, it is high, narrow, and tortuous, filled with places where a small company can hold off an army. Aglarondan watchtowers keep an eye on the pass, but these days they greet Thayan trade caravans instead of fending off raiders. Umbergoth is the mightiest mountain in all of Aglarond. In recent years, Nartheling, an ancient fang dragon, decided to carve out a home for itself in the caves riddling the snow-capped crest. This creature plagues the trade caravans passing back and forth between Aglarond and Thay. It doesn't choose sides, but it prefers the Thayan trade trains stocked with magic items. It remains a mystery why the creature is gathering such things and what it plans to do with them. Umbergoth is so high that its peak always wears a snowy mantle, even in the hottest days of summer. Griffons, hippogriffs, and giant eagles used to soar in the updrafts around the mountain, but Nartheling has scared off all but the most foolhardy of such beasts. The Umber Marshes are so named for their rust-brown color, which they get from vast amounts of submerged iron. More than one dwarf has commented, "If you could only drain it, what a beautiful mine you'd have." These wetlands consists of almost impassable bogs, swamps, and mudflats, run through with shallow streams that drain south into the River Lapendrar and from there into the Wizards' Reach. Both Aglarond and Thay claim the territory, though neither country really wants the waterlogged lands. Since they form the first line of defense between two nations that have traditionally been at war, many conflicts have played out here, the muck running crimson with the blood of armies. The most effective troops in this miserable land are Thay's undead hordes. However, the dampness causes zombies to rot at an accelerated pace, and undead foot soldiers fare no better than the living when traversing the muck. The Umber Marshes are also home to dangerous creatures, including monstrous vermin, poisonous snakes, hydras, shambling mounds, and trolls. Yet those threats seem minor compared to the clouds of biting insects that follow every red-blooded creature passing through the place. These pests are sources of disease as well as discomfort, and more than one noble warrior has met an ignoble end by such insignificant creatures. Recently, the shambling mounds of the Umber Marshes have either found a leader or developed some sort of collective intelligence. At first, they lined up about a mile from the marshes' southern border, gazing out toward the River Lapendrar beyond. Now they have formed a second line looking up and out at the Watchwall, and some have been spotted as far west as Glarondar. Some of Thay's zulkirs, including Szass Tam, believe the shambling mounds are the reconstituted remains of thousands of undead soldiers lost in the marshes, and they hope to advantage of this. If they can magically wrest control of these creatures, they can turn what was once a natural barrier into a terrible weapon against the people of Aglarond. The truth is so far unsuspected by both Aglarond and Thay. A trio of undead druids known as the Umber Council have been creating and directing the plant monsters for months. The druids have set up a vast underground lair in the heart of the marshes, forming vines and plants to prop up the rooms and tunnels they forced open in the muck. The leader of the Umber Council is Ysvel the Black (NE female lich Drd18) who was driven mad by an ancient artifact - a rusted iron rod known as the Ironwood - that she uncovered in the sucking mud of her home marshes years ago. She killed her acolytes in their sleep and then turned them into juju zombies at the command of the device. Under its malevolent influence, she transformed herself into a lich - a rare choice among druids. She now leads her undead fellows in creating an army of shambling mounds. No one knows what Ysvel plans, but she's clearly up to no good. Along the southern shores of the Aglarondan peninsula lie the cities of the Wizards' Reach. Between the Sea of Fallen Stars and the Yuirwood stretches a broad, sunny plain more than 300 miles long and up to eighty miles wide. Unlike the northern coastal plain, the Wizards' Reach is low, marked by extensive tidal marshes and barrier islands, which makes east-west travel difficult. The Wizards' Reach is not part of the kingdom of Aglarond and never has been. It is so named for the powerful magical empires that dominated this stretch of water for thousands of years. Its cities were founded by the people of ancient Unther (and Chessenta, which was subjugated by Unther at the time), and over, the last ten centuries they have been Untheric colonies, independent, a loose league of their own, Chessentan conquests, independent again, and finally Thayan conquests, which is the current situation. In practice, the Red Wizards hold Escalant in strength, Laothkund loosely, and Delthuntle not at all. The Wizards' Reach has always been wilder and less settled than the lands to the north. It has been nearly three centuries since any single power grasped these cities in one hand, so communications and settlement in the lands between are haphazard. Monsters shelter in the southern eaves of the Yuirwood, roaming the wilder places of the coastal plains, and the marshes are home to dangerous lizardfolk and sivs. Most travel and trade between cities is by sea - ruined settlements and forgotten towers are common along the abandoned coastal roads. The Yuirwood is named for the Yuir, the ancient star elves and green elves who once made this part of the world their home. Once this vast, green forest covered almost the entire peninsula, but today Aglarond's largest cities and most of its people are scattered along its rocky northern coast. In six centuries of human settlement, its northern edges have receded up to fifty miles from the coast at some points, but the tenacious forest seems to be making a comeback. The Yuirwood divides Aglarond into two nations - or three, if you count Altumbel as separate, as its inhabitants do. The Aglarond most travelers see is the old human realm of Velprin along the coastal plains of the northern shore. It consists of wide, rolling farmlands and handsome port cities, interspersed with the manors and estates of Aglarond's human nobility and wealthy merchants. While half-elves thrive here, they are outnumbered by their human kin. Some fear that in the lands north of the Yuirwood, Aglarond's half-elven heritage is slowly drowning in a rising sea of humanity. The other Aglarond - the old, true land - consists of the half-elf villagers and foresters who call the Yuirwood their home. These are an insular people, suspicious of strangers, even fellow Aglarondans of the coasts. They recognize the rule of the Simbul and her advisory council but have as little to do with the outside world as possible. Those who get to know the people of the Yuirwood find them to be warm companions and loyal friends. This is rare, however, since the half-elves hide in the deep woods and do not confront strangers unless pressed by need or circumstance. The Yuirwood is a temperate deciduous forest, with milder winters than typical of a land at this latitude. In the spring and summer, it is a sweltering tangle of brush and dense thickets, virtually impassable to anyone who doesn't know its ways. A low but rugged spine of forest-covered hills runs the length of the peninsula, and from these well-watered highlands innumerable streams descend to the coastal lands, although few are large enough to be termed rivers. Game is plentiful but wary, as dangerous beasts and monstrous predators hunt through the green gloom. Few truly malevolent creatures haunt the forest, but foul-tempered beasts such as boars or monstrous spiders are every bit as dangerous to the unwary traveler. Strange enchantments and old, strong magic are thick in the Yuirwood. The ancient star elves were masters of powerful magic, and they left behind two legacies that continue to be useful. First, the Yuirwood is impenetrable to detection and scrying magic. Attempts to pierce the Yuirwood's leafy canopy reveal the wood, but that's it. They cannot reveal any specific location, nor can they magically locate or track anyone under its boughs. The subject is not shielded in any way - it just seems not to be there, or anywhere else, at all. Over the centuries, this phenomenon has served Aglarond well, since enemies who inspect the place magically find nothing to report. Second, the Yuirwood is littered with ruins, remnants of the great elven society that once called this laud home. These are wonderful places for treasure seekers, but the most amazing ruins are the circles of menhirs, standing stone monuments carved in an ancient Elven dialect. The magic of these circles has faded with the strength of the Yuirwood itself, but there is some power left in them. The menhir circles, many of which are nearly swallowed by the forest's undergrowth, form a network of portals that can be activated by those who know their secret. This knowledge is guarded by an elite group of half-elven druids and rangers known as the Masters of the Yuirwood. Using these circles, they can quickly transport themselves and their friends from one point in the Yuirwood to another instantaneously. Menhir circles sometimes trigger themselves by the light of a full moon, and they are frequently employed by the Yuirwood's fey folk on these nights. Any of these portals can connect to any other menhir circle within the Yuirwood, but never beyond - at least not intentionally. When not triggered by a Master of the Yuirwood, treat these stone circles as malfunctioning portals. More than two thousand years ago, the depths of the Yuirwood held the realm of Yuireshanyaar, home to the reclusive star, or mithral, elves. Faced with aggressive human settlers along the Wizards' Reach (most from Old Unther) carving out lands of their own from the ancient forest, the star elves decided to withdraw from Faerûn. Their High Mages forged a forest-wide network of stone circles and then worked a mighty spell through the standing stones that created a demiplane for the star elves to call their own. Most departed Faerûn at that time. Sildëyuir is a plane of eldritch beauty, a land of perpetual twilight illuminated by a host of glittering stars. It extends about as far as the forest's borders, and like the Yuirwood, is an unbroken expanse of deep green dells and hidden brooks. The, star elves raised great glass citadels for themselves and live there still, masters of song magic and lords of this fey realm. If you are using the Manual of the Planes, Sildëyuir has the following properties. Flowing Time: Two days on the Material Plane equal one day in Sildëyuir. Finite Size: Sildëyuir is coterminous with the Yuirwood. Alterable Morphic: Objects remain constant unless affected by physical force or magic. No elemental or energy traits. Strongly neutral-aligned: Intelligence, Wisdom, and Charisma-based checks take a -2 penalty for non-neutral creatures; -4 for beings with two non-neutral components in their alignment. Enhanced Magic: Spells with the sonic descriptor are empowered and heightened by two levels in Sildëyuir. The ancient menhir circles of the Yuirwood hold portals leading to Sildëyuir, although most are keyed to function only for star elves. The Ethereal and Shadow planes are not coterminous with the demiplane, so spells using ethereal or shadow effects do not work there, but the Astral Plane is accessible. Sildëyuir has been under assault by a race of alien sorcerers of great power for several centuries now. The nilshais, natives of some distant, horrible reality, stumbled across the existence of the demiplane long ago, and they seek to invade Sildëyuir and subvert it to their own twisted purposes. (See the Nilshai.) Each incursion is more difficult to fend off, and large portions of the realm have been poisoned by the nilshais' alien sorcery. From these corrupted regions horrid, unliving spawn emerge to haunt the silver woods and terrorize the citadels of the star elves. Some among the mithral elves counsel abandoning their extraplanar home and returning to the Yuirwood, while others argue for seeking help from their kinfolk in Aglarond's forests. The Sunglade is a clearing in the center of the Yuirwood. It resembles any meadow, except for the two concentric circles of menhirs standing here. Long ago ensorceled, the area is impervious to the ravages of time: Its grasses are well tended and the rocks are free from vines or moss, despite being undisturbed for untold centuries. The outer circle of menhirs is the tallest of the two, the rocks standing nearly 20 feet high. They are carved with ancient Espruar runes dedicating each stone to one member of the Seldarine, the elven pantheon. The stones of the inner circle are a mere 6 feet tall. These are carved in the same style as the others but are dedicated to the forgotten pantheon of the folk who lived in the Yuirwood even before the star elves. Most menhir circle portals in the Yuirwood only transport someone to the nearest such ported, but the Sunglade's portal is special. Those who use it can transport directly to any of the Yuirwood's portals.